Are you paying too much on your energy bills but still having trouble keeping your home warm? Doorways are a common culprit. When air gets in from under and around doors, drafts are created making it harder to maintain the indoor temperature you want. Luckily, there’s an easy way to take care of this problem with weatherstripping. Weatherstripping involves placing a piece of material along the bottom, top, and sides of windows and doors. Made from a variety of materials like plastic or metal, the material acts as a physical barrier to prevent cold air from seeping in and causing heat loss, or vice versa in the summer. Sealing your doorways and windows with these insulating strips, in either a single or double layer, will help protect your home against losing heat and will help you stay warm in the winter months. It can be done around all exterior doors and windows, especially doors that lead into garages and attics. How do you know if you need weatherstripping? 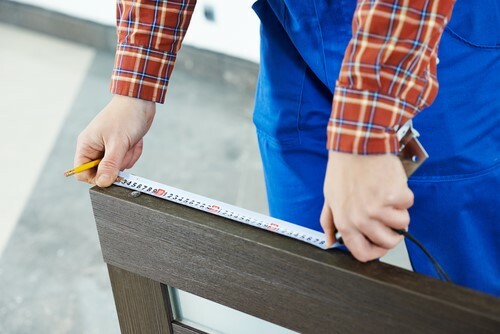 Examine all exterior door thresholds, looking especially closely at the metal or rubber components attached to plastic or aluminum stabilizers. Some common signs of deterioration caused by weather, water, and foot traffic are tears and breaks in the rubber parts around doors. On windows, look out for parts where the strip has come loose or is torn. If you can feel a draft, that’s an obvious sign you need new weatherstripping. You can test if drafts are coming through easily by using a hand-held hair dryer and blowing it around the door and window frames. Get a helper to move their hands over the frame from the inside to test if they can feel the air coming through. This can help you determine where you will need a layer of weatherstripping. Another sign is if your energy bills are increasing, yet your home is still perennially cold despite cranking up the heat. Weatherstripping may prove to be the smarter choice for maintaining the temperature in your home. If you still aren’t sure and want a professional opinion, don’t hesitate to contact us for an inspection and quote. What are the Benefits of Weatherstripping? You can enjoy a whole host of benefits just by updating or adding weatherstripping. Did you know that air leaks account for up to 30-40% of heat and cooling losses in the home? Not only will you save money when you no longer have to manage heat loss by constantly turning up the thermostat, but you will also be doing your part to conserve resources and cut down on unnecessary fuel costs. Your home’s insulation will also be protected from damage that reduces its functionality. This is caused by moist, warm air leaving the house and dampening it. Enjoy a warm, comfortable home without dealing with the chilly annoyances of drafts and erratic temperatures. You don’t have to be bundled up in sweaters during this winter season enduring a chilly home. You don’t even have to worry about performing the weatherstripping yourself! All you have to do is contact Doors of Elegance to find out more about our door weatherization service and when we can schedule an appointment to fix up your doors.